Last week a prominent Iraqi Sunni cleric joined a handful of visiting dignitaries in paying homage to Iran’s supreme leader Ayatollah Ali Khamenei. The image of Abdel-Latif Humaim kissing Khamenei along with other leaders of Iran’s proxy groups attending an international Islamic unity conference in Tehran was highlighted in a footage broadcast over Iran’s state-run television. In many respects, a televised encounter between Al-Humaim, the head of the Sunni Religious Endowment in Iraq who served in former dictator Saddam Hussein’s administration and who until recently was an ardent supporter of the Sunni insurgency in Iraq, and Khamenei would have been unthinkable until recently. It opens a window on how Iraqi Sunnis have been moving, albeit at a slow pace, closer to Shia Iran. Following the US-led invasion of Iraq in 2003, which toppled Saddam’s Sunni-led regime, Iraq’s Arab Sunnis were opposed to the empowerment of the majority Shia population and soon displayed their disapproval at the way Shia political groups were running the country. They tried many tactics to achieve their goals, including an armed insurgency. The Sunnis had their own strategic reasons for this, but they paid a terrible price during the decade-long struggle to overturn the situation, and in the end this was without success. They failed to make significant political gains that could pose an existential threat to the Shia-led governments in Iraq which have been able to consolidate their power with Iranian and US backing. In contrast to their former policy of keeping fighting in the hope of eventually eroding the Shia resolve, the Iraqi Sunnis have more recently shifted their position and accepted the status quo. This dramatic shift has led Iraq’s Sunni political groups to adopt a posture of reconciliation and compromise with rival ruling Shia groups. The defeat of the Islamic State (IS) terror group in 2017 gave new weight to Sunni options, encouraging them to drop a confrontational approach and draw closer to the ruling Shia groups and in particular to the Iran-backed Popular Mobilisation Force (PMF), an umbrella organisation for Shia militias which played a critical role in the war on IS. How did that surprising twist happen? Has it been backed by the whole Sunni community? Is it a strategic or a tactical move? Does it serve the Sunnis’ final goals? And is it likely to succeed? These are all key questions that remain unanswered, but they require attention in order to explain the attitudes of the Iraqi Sunnis towards the post-war state. Iraq’s Sunnis have been brutalised by IS, which seized their cities and towns and forced some four million of them to flee their homes. There was a tremendous sense of relief among Iraq’s Sunni Arab population at the liberation of their cities from IS. The Sunnis wanted to move forward to rebuild their cities through government help and translate the successes of the security forces and the PMF into enduring stability. The victories over IS have also emboldened the Shia ruling groups and allowed the PMF and other Shia militias to capitalise on the space left by the withdrawal of IS militants from the Sunni areas and become the dominant forces on the ground. Moreover, the powerful PMF has become a political force seeking to establish a legitimate institutional presence and play a role in national politics in Iraq. The Iraqi Shia-led government’s successes have also reinforced Iran’s presence in Iraq and enabled Tehran to become a dominant actor on the ground. The expanded Iranian presence in Iraq has shifted the balance of power in favour of its proxies and away from other actors, and it has made the Islamic Republic effectively the main power-broker in Iraq. Despite US pressure, Tehran seems to be determined to preserve its gains in Iraq and even to dominate the future of the country and use it as a base to expand further in the region. On the other hand, the long-brewing crisis in Iraq has exhausted the confidence of Iraq’s Sunni Arabs in their traditional supporters in the Arab Sunni states in pushing back Iran and its proxies in Iraq. In responding to the Shia empowerment and the increasing Iranian influence in Iraq, key Sunni Arab governments have rallied behind their co-religionists in the country. However, many Iraqi Sunnis now feel that their Arab Sunni neighbours have failed to forestall the consolidation of Shia power and the increased entrenchment of Iran and its proxies in Iraq. They also think that the Sunni Arab countries’ involvement may have potentially worsened sectarian issues and ultimately communal tensions in Iraq. Amid this challenging mix, Iraq’s Sunnis seem to be seeking to redefine their role and to find a new strategy to face up to Shia majority rule and end their perceived marginalisation. The cooperation between the Sunni tribes and political leaders with the PMF in fighting IS and liberating Sunni cities has established broader mutual trust and encouraged them to develop this into a rapprochement with the country’s Shia majority. This dramatic shift was manifested in the May elections in Iraq when Sunni factions entered into alliances with the main Shia blocs on declared cross-sectarian tickets. Several Sunni groups joined the PMF’s parliamentary bloc the Fatah Alliance, which came second in the elections with some 46 seats in parliament. 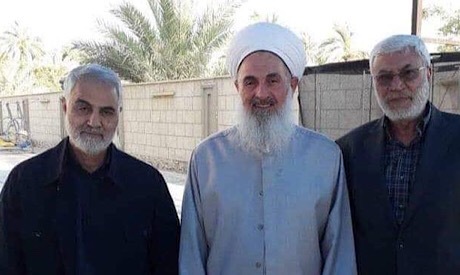 One of the Sunni politicians whose group had joined forces with the PMF in Anbar Province, Mohamed Al-Halbousi, was even elected to the prestigious post of speaker of parliament with the backing of the Iran-backed Fatah Alliance. Yet, it is difficult to measure the success of the new Iraqi Sunni policy and whether it is a temporary posture or a clearly calculated long-term vision. There is also no way to gauge the level of support the new approach enjoys from the Sunni community at large, or to judge whether it is simply the brainchild of Sunni political elites that have been in the parliament and the government and want to preserve their gains in post-IS Iraq. However, there are plenty of other reasons to feel sceptical about this Sunni-Shia détente and whether it could eventually turn into Sunni recognition of the idea of Iraq being redefined to mean a Shia-dominated polity, an option which the Sunnis have been resisting since the regime change in 2003. So far, all the parties have insisted that the new parliamentary alliance only reflects a cross-sectarian approach to Iraqi politics, and they have sought to keep the identity debate between the Shias and Sunnis at arm’s length from national politics. It was, after all, the conflict between the two communities that led to the massive violence in Iraq and the rise of IS and its seizure of one third of Iraq’s territory in 2014. Indeed, the showpiece of a cross-sectarian alliance designed to agree on the formation of a new government masks a greater problem because it ignores intractable challenges that have so far eluded national reconciliation and an enduring power-sharing agreement that could end religious, political and societal sectarianism in Iraq. Complicating matters, the split in Iraq is also clearly articulated in the broader sectarian divide in the Middle East and in particular in the geopolitical competition between the Sunni Arab countries and Shia Iran. The Sunni Arab nations are not powerless, and they may take on Iran and its proxies in Iraq. Some of them, such as Saudi Arabia, are political, economic and military powerhouses that can still exert influence in Iraq that could be effective in supporting the Sunnis. Any attempt to overlook this regional conflict and its geopolitical and human complexities through a tactical approach would be a too-simple solution to the identity-based power struggle in Iraq. Fighting sectarianism at its core may matter more to the entire Middle East than resolving political issues such as the distribution of seats in government and the allocation of revenues to the various provinces in Iraq.